Lost dog! REWARD OFFERED FOR HIS SAFE RETURN, NO QUESTIONS ASKED. 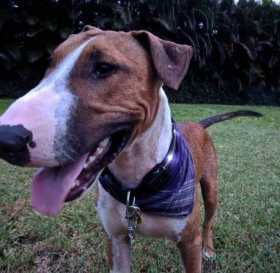 Kūlolo - red/brown and white bull Terrier hound mix. Male, about 55 pounds. Wearing a red collar, microchipped, neutered. Went missing from 1/5/19 in Keapana valley. Last seen on Kaapuni Rd. headed away from the middle school, possibly toward the park? at Baby Beach and/or on Oloheana Road. Please call with ANY info! We are missing this boy super hard. He is shy, doesn't bite, and is probably hopelessly turned around.